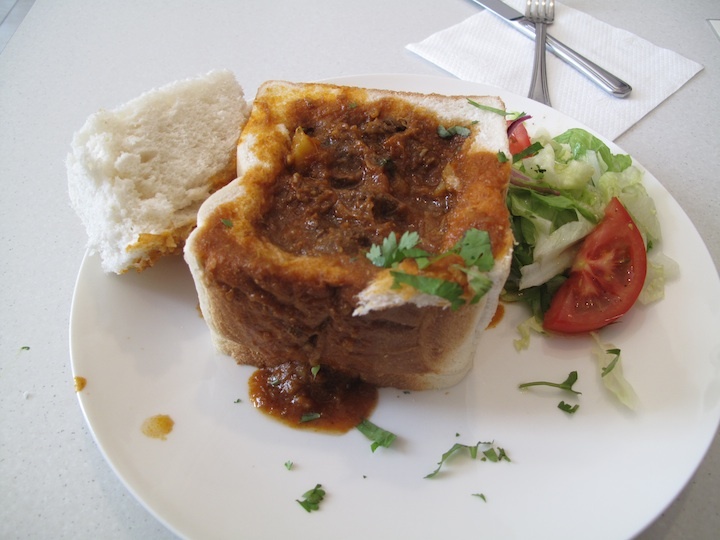 A couple of years ago, Consider The Sauce was very excited to try – for the first time – the funky South African workingman’s soul food that is bunny chow. 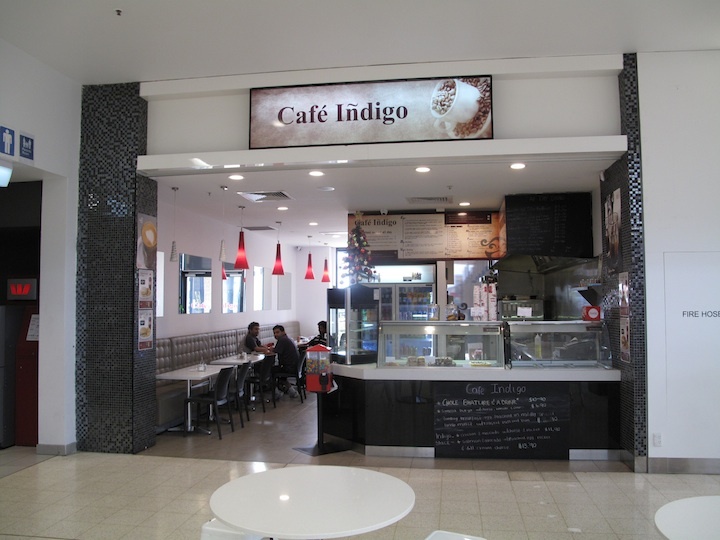 Sadly, before I got around to a return visit to Sanctuary Lakes shopping centre for a return encounter, the humble cafe concerned closed down. So I was delighted, as we ambled away from enjoying Nelson Place’s new Italian joint, that Bennie noticed the above notice in the window of a nearby Indian eatery. At the first available, opportunity I’m there. 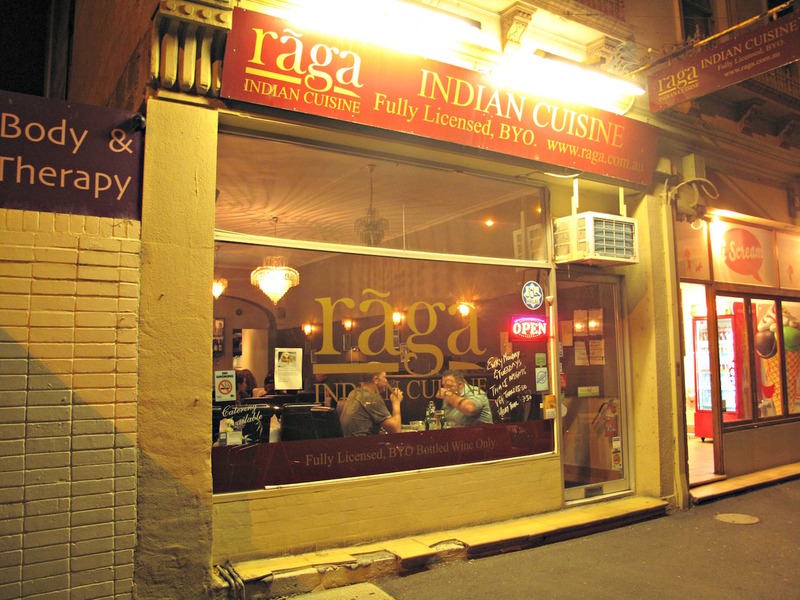 After I order my lamb bunny, the staff/management soon work out I’m “that guy with that camera” – and I am unsurprised to learn Raga has ties to the now defunct Point Cook cafe at which I first tried a bunny chow! So I am brought a complementary dish courtesy of the chef. Quail 65 is a knockout – and probably the best Indo-Chinese dish I’ve ever tried. 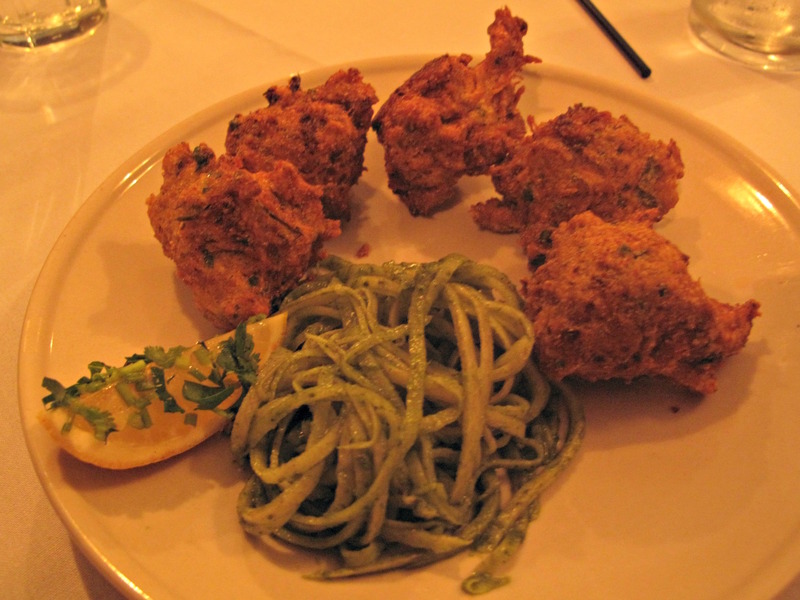 The rotund fritters are wonderfully crisp and nicely salty on the outside, while the shredded quail meat inside is fabulous. All is attended by lovely, spiced cucumber noodles. But I am mindful of leaving room for my bunny so donate the remaining two fritters to the grateful inhabitants of the adjacent table. Now take it as given that my experience with bunny chows is limited … but that said, I reckon my Raga lamb bunny is a killer delight. The accompanying salad, served in a giant prawn cracker, is just right. The lamb curry is plentiful, very spicy and studded with tender spud chunks. This time around, knowing a little of bunny lore, I make only small use of cutlery, mostly use my hands and love every mouthful of curry and bread. But it’s a big meal and I call a halt to my feasting after consuming all the curry and about half the bread. I suspect experienced Durban bunny hounds will snort with derision at paying $17.50 for what is ostensibly blue-collar street food. But I don’t have any problem with the price tag – it’s a good investment, IMO, for a fine meal. 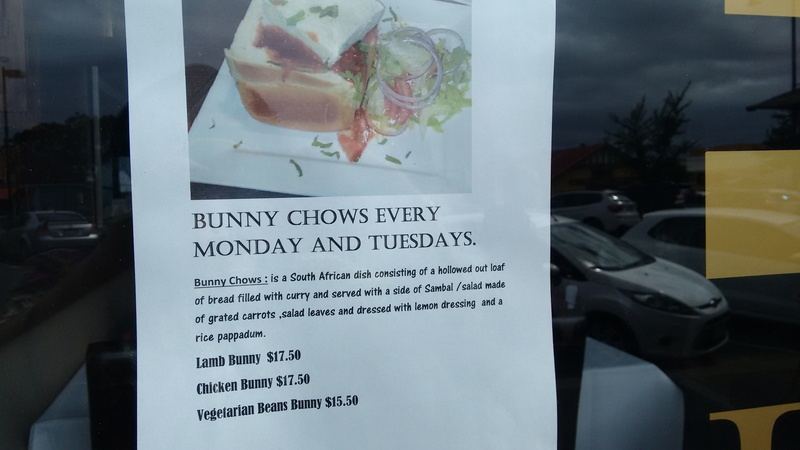 And especially given this is probably the only place in Melbourne, and even within Australia, that serves bunny chows. After all the cafe-style Indian places we frequent, it’s been real nice to spend some time in a proper, well-appointed Indian restaurant. And the thalis ordered by a happy a neighbouring table seem like a great deal. 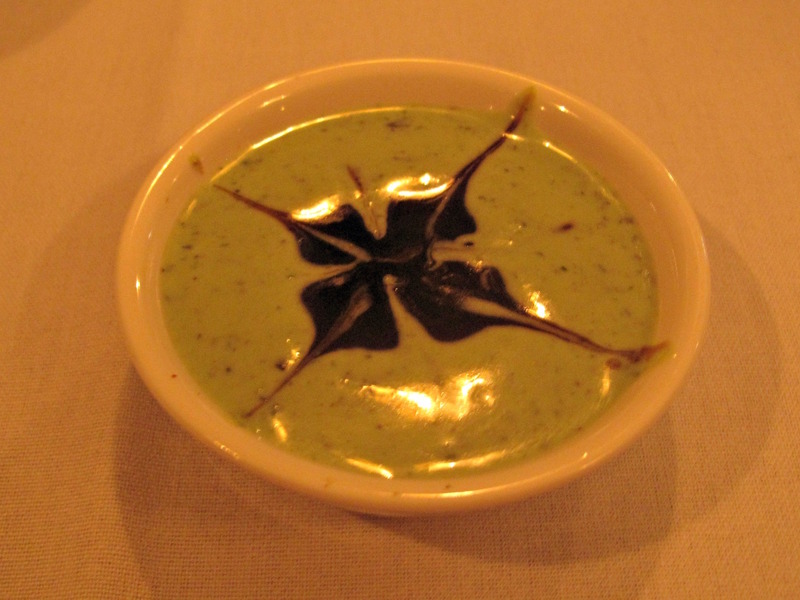 The thalis, like the bunnies, are served on Mondays and Tuesdays. The mint/tamarind sauce that came with my papadums was adorned with latte art! 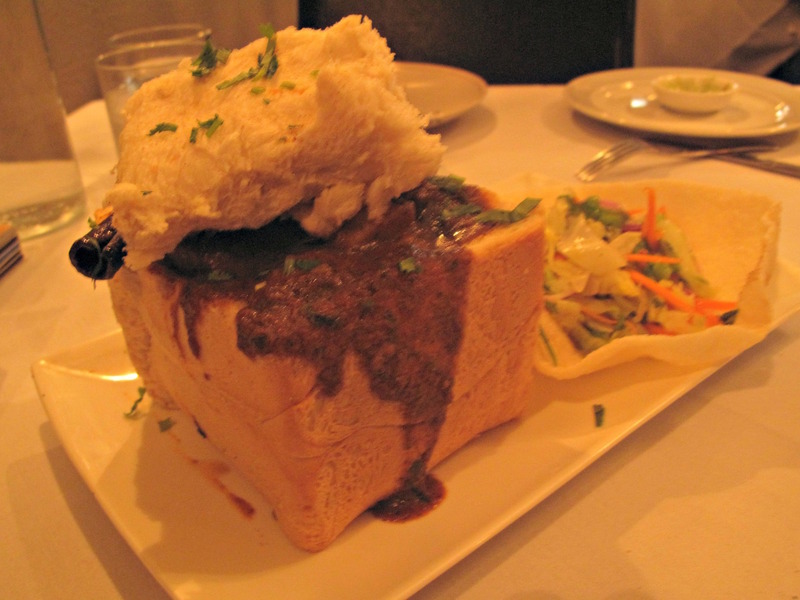 Holy cow – bunny chow! Sanctuary Lakes shopping centre for a meeting with a new friend, new contact, new editor of a new newspaper. Am headed for a centre stalwart we have enjoyed on previous occasions, sparing only a quick glance for a cafe I have previously noted with some interest but which has been put in the “another day” category. But what’s this? Cafe Indigo just got a whole lot more interesting. Item: Chole bhature. Hell yes! A CTS favourite … but perhaps not today. Item: Samosa burger … well, that sounds pretty good, too! But what is bunny chow? 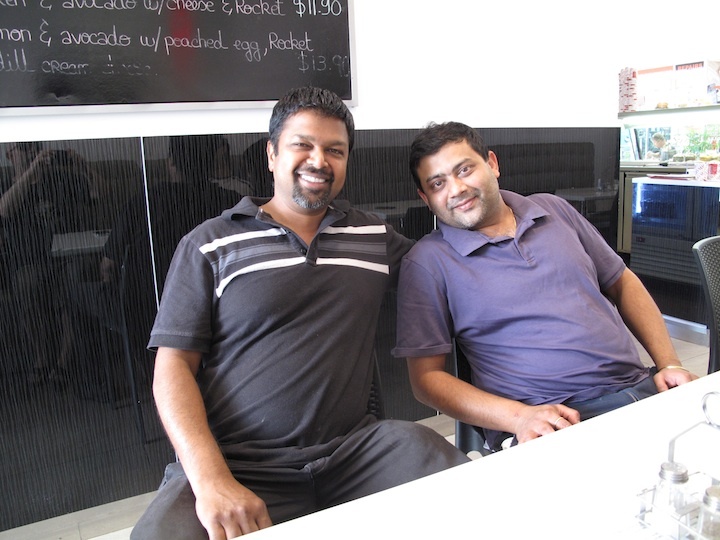 Pradeep explains that it’s a South African dish in which curry is stuffed into bread. OK, I’m in … just the kind of thing I love taking a punt on. In the meantime, and as I await my lunch, I get sleuthing – and discover a whole world of funky working man’s tucker that fits right in with the Consider The Sauce world view. While bunnies can be found all over South Africa and even the world, the spiritual home of the bunny is Durban. This apparently authoritative piece at Wikipedia has a rundown on bunny lore, as does this one at Facts About Durban. I even discover the most fabulous blog, Quarterbunny, which is run by a crew I “heart” instantaneously – they’re driven, possessed and obsessed, and completely unapologetic about it. Quarterbunny has reviews and photos of such splendidly named establishments as Patel’s Vegetarian Refreshment Lounge and Mrs Govender’s Curry Kitchen And Take Away. I’m not sure what the Quarterbunny experts would make of my Cafe Indigo bunny, but it tastes really fine to me. The lamb curry is mild but wonderfully sticky, and has the odd cardamom floating about and some nice potato chunks. I just love the way the curry gravy soaks into the bread. And that bread, by the way, is your standard white loaf. This is working man’s food and your boutique bread nonsense is not only unwanted in this sort of terrain but would be an outright disaster. 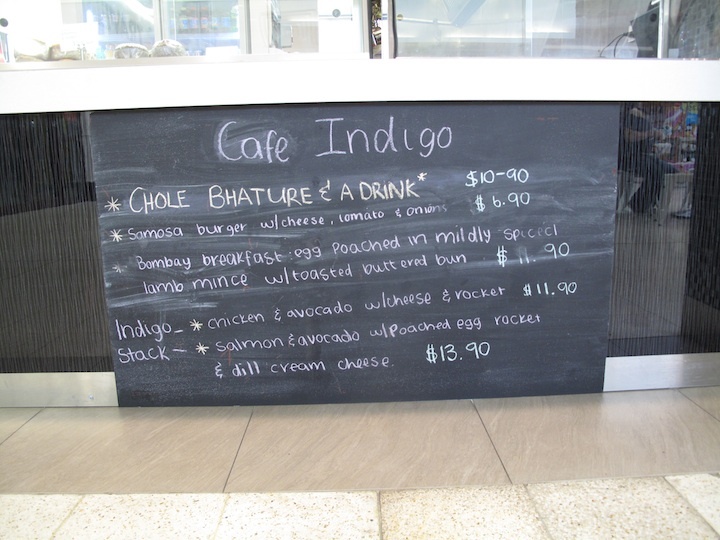 The asking price for my Cafe Indigo bunny is $11.90, which I suspect would horrify your typical Durban bunny maven. But I consider it a good deal given shopping centre rents and the opportunity to embrace a soul food genre of which I have been – until this very hour – completely ignorant. As I await my new friend, I enjoy a long chat with Pradeep and Ankur about many things Indian food and eateries, especially those spread across the west, resolving all the while to return soon to try their vegetable and chicken bunnies.